​A Campbell County Parks and Rec Department 1% grant has sponsored a seedling tree for every 4th grade student in Campbell County in 2017. 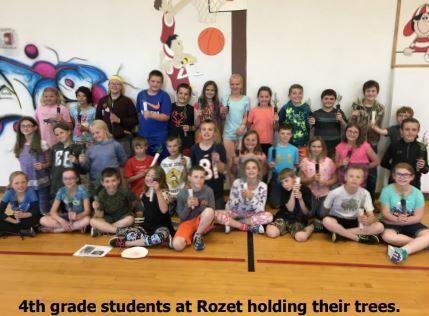 A total of 270 Rocky Mountain Juniper and 270 Ponderosa Pine seedling trees were purchased for distribution to students in 15 schools. Crystal provided tree education activities to all of the participating 4th grade students. Our goal is to educate the youth of Campbell County to ensure the next generation will be wise stewards of America’s natural resources. The project also helps youth develop citizenship values and respect for the environment.